And you thought zombie comics were a recent idea? Over the centuries, medieval artists applied their talents to illustrate a mysterious tale of animated corpses who tormented the living. 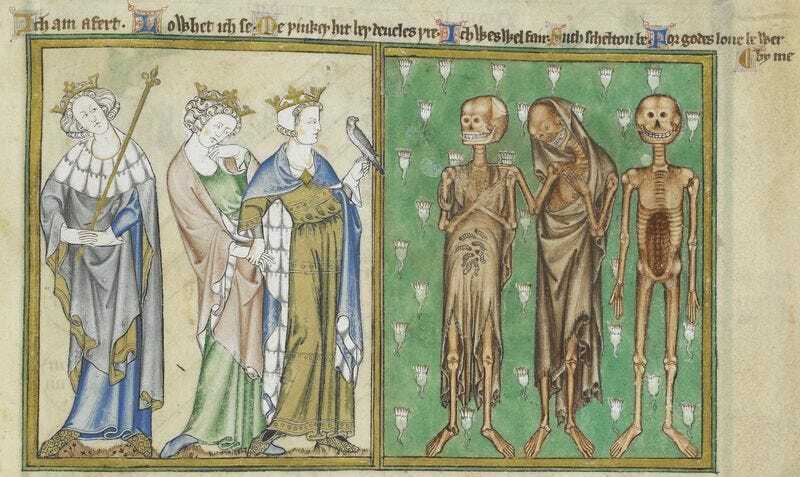 The precise origins of the "Three Living and the Three Dead" are still somewhat mysterious, but there are many versions of the tale dating back to the 13th century, with the best-known coming from England and France. The basic version of the story goes like this: three young noblemen are out hunting when they suddenly come across three corpses, which are in varying states of decay, but nonetheless still animated. Unsurprisingly, the young men express shock and dismay at the sight, while the three corpses admonish them to consider the transience of life and to improve their behavior before it is too late.